In the upstairs hallway, at the top of the stairs, facing the road in front of the house, we put an old farmhouse table. 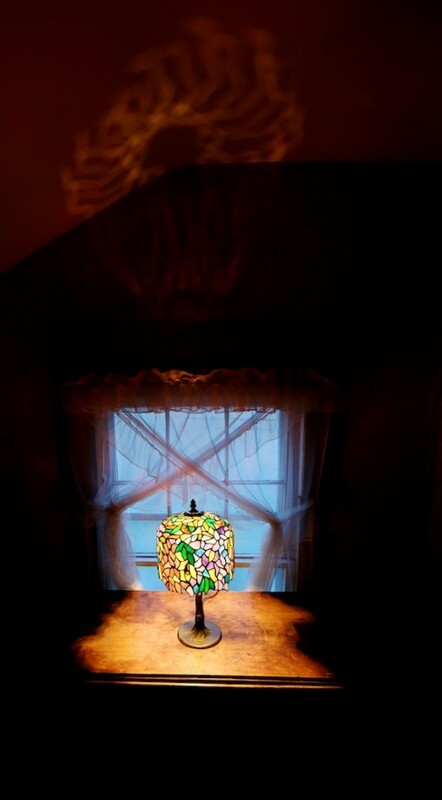 We had an old stained glass lamp I bought years ago from an antique dealer. Maria had this idea to put a lamp on the table, and yesterday Will Lindenoll, our electrician, put an outlet there for us. Last night we lit this lamp and it will be lit every night. It is a symbol, a guide, an inspiration, for people outside and people inside, the contemporary version of the storied light in the window that used to guide and comfort travelers in the country. Now, more than ever, we seek connection and our light is a connection, a beacon, to the world beyond. For me, it has a different purpose now. Each morning, it reminds me to move forward, to seek light and the opportunity to lead a meaningful life. Light banishes fear and brightens my darkness. The light inspires me to do my work, to bring light and color into my writing, my blog, my photographs. The light in the window is important to me. It moves me forward in life, and gives me strength and hope. I believe in symbols like that. I love the idea that the drivers of all the cars and trucks that go by each night will see our light in the window and perhaps it will brighten their drive. It brightens my nights, another gift from the great heart that beats inside of my wonderful wife.